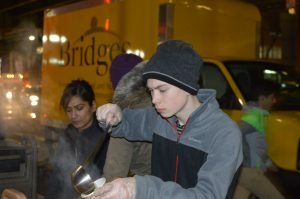 SOUPMAKERS – Bridges Outreach, Inc.
We serve hot soup on every Run, and are always looking for people willing to spend an hour at the Oakes Center making the soup before the Run. We serve canned soup that we supplement with frozen vegetables; Bridges provides all ingredients. Sign up to make soup April/May 2019 here. Sign up to make soup June 2019 – May 2020 here.